Lukas Gritsch, PhD student at the Institute of Biomaterials under supervision of Prof. Aldo R. Boccaccini and Dr. Chris Lovell (Lucideon), was awarded a prize for the 2nd best poster of the Summer School & International Workshop on Advanced Materials Challenges for Health and Alternative Energy Solutions (AMAES V) held on 31st of August-3rd of September at University of Cologne, Germany. The awarded poster is entitled “Fabrication of Chemically Modified Chitosan Films and Preliminary Characterization“ and it presented results obtained in the context of the HyMedPoly project, funded by the European Union’s Horizon 2020 research and innovation programme. 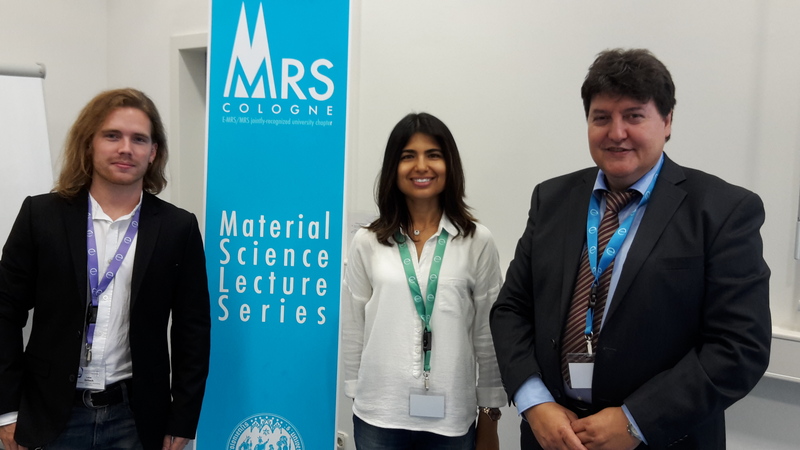 In the photo, Lukas Gritsch, Seray Kaya (also PhD student based in Erlangen) and Prof. Aldo R. Boccaccini.